When it comes to the wedding of champions, curiosity is in overdrive. Special curiosity is always the dress of the bride. In the case of the wedding of the Olympic champion in rhythmic gymnastics Margarita Mamun and swimming champion Alexander Sukhorukov, this topic is special, because the first dress was made by famous designer Alena Akhmadullina. 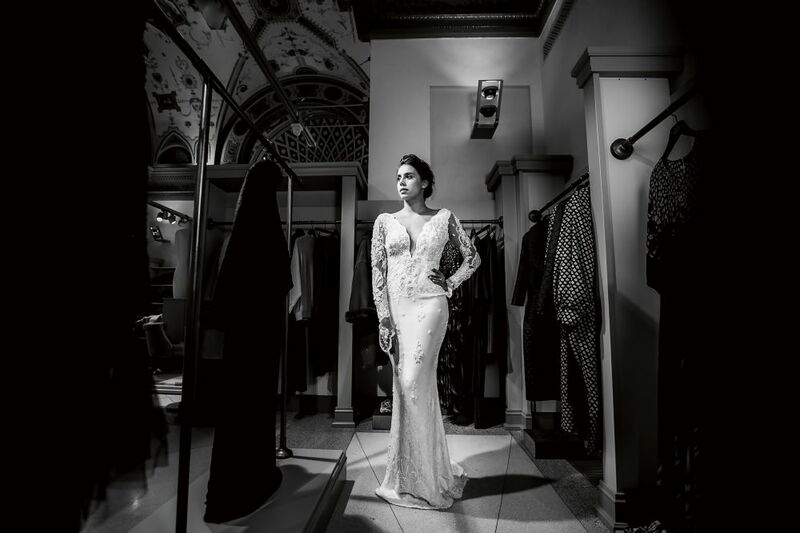 Did you have a childhood dream about how you will look like a bride? No, I never imagined myself a bride, wedding inspiaration came from movies. And anyway, my wedding is the first wedding I've been. In connection with my training processes and competitions, I always missed the weddings of my friends, and they all seemed to me to be scenes from some American films. It seemed to me that it was so far from me, and there was a feeling that it would never happen to me - not just the very fact that I would get married, but a celebration. It's like championships and Olympic games. Everything from the outside seems different, than when it happens to you, everything was for the first time and was done the way I wanted (laughs). This is the most important, in fact. But you have a high character, so you clearly knew what you wanted? You can only know clearly when you want something, and I did not know anything. They ask me: "What kind of style do you want? ", And I say: "How can I tell if I have not seen anything?" Therefore, when I asked, I was offered, and I decided - it will be so. I had to have a choice to make the right decision. Maybe you said that you saw a movie, and wanted it like that and I did not want it like this. I said so about the dress. Said that I will not have the magnificent, huge, like Cinderella, dress, because I really do not like it, I immediately become like a samovar. I went to some salon to understand what I wanted, and then I went to Alena and clearly said what first dress I needed. Do you remember what you said to her at the meeting? It was generally a five-minute conversation. We discussed only what cut-out and depth will be in front, whether there will be a cutout in the back, in principle, long sleeves or sleeveless, understood each other and began to work. That is it turns out, you were not engaged in the process of choosing a fabric, anywhere? Alena immediately offered me three variants of fabric, and the first fabric I saw just went to the dress. Yes, very very fine lace. It is not clear how the girls who work for Alena, were able to embroider such a quantity of pearls, firstly, and secondly, such a thin, simply weightless lace. I understand that the other task was to do everything quickly? Yes, because I came to her in less than a month (laughs), the wedding itself was organized in less than a month, by the sports agency ONE SGM, which conducts my business. Yes, August turned out to be very busy for the show, for master classes, for training and other projects, and trips to the competitions, dresses - one--another-third, site selection ... Ooh, it was horrible (laughs) ). Yes, but it was interesting! 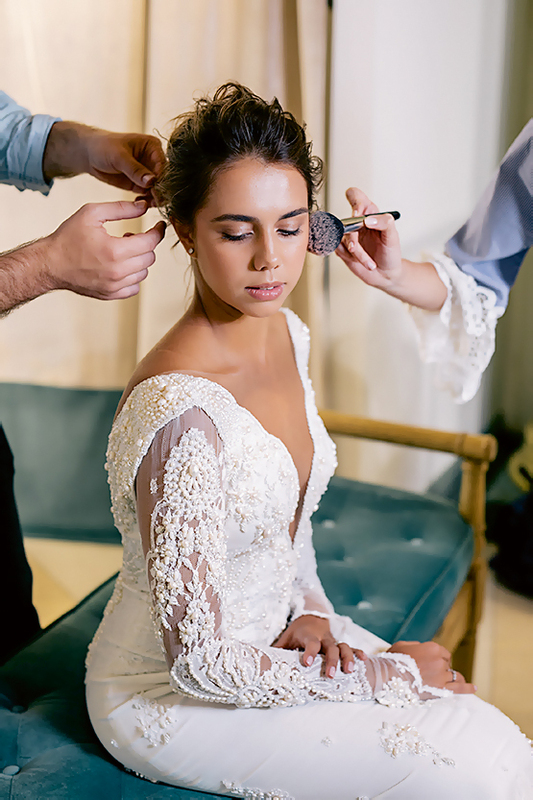 Do you remember your feelings when you saw yourself in a mirror in a dress, with a make-up, with a hairdo, a ready-made real bride? Well, it was really a bustling morning, it was all in one day: the choice of jewelry, and the photoshoot in another dress, the registrar's office, the celebration, the filming of videos, the shooting of everything in general, and I just did not even have time to look at myself, like me said: "Rita, run, come on, there Sasha is already waiting for you for half an hour!" Stylists put makeup on me and made hairdo without preliminary rehearsals, there was no mirror next to me, and I was very nervous, because I was doing everything in the middle of the hotel room, everyone was running around, and I myself ran periodically to look at myself in the mirror, because it's hard when you got your makeup on, and you do not understand what's going on there, you have to control everything (laughs). I'm telling you now, but I have a feeling that it was a dream, that I still have all this. And the dress was comfortable at the wedding? For you it is important that it was convenient to physically move, walk? I wanted it to be beautiful! Then my mother calls me and asks: "Rita, can even put on shoes at least? Or throw a bouquet of the bride in this dress? " But everything turned out fine, everything was fine and comfortable, and they took pictures, and I could raise my hands. For the dance, I changed into another, freer dress. In general, everything was super-ideal! Rita originally came with a clear vision of her wedding look: she prepared in advance, went to several salons, took a photo and sent them with comments, what she likes in each particular model, and what I would like to change. I offered her a silhouette in the style of Alena Akhmadullina, and we immediately found understanding, although such unanimity happens very rarely, especially when it comes to a wedding dress. Perhaps this is the most important and the most difficult in the individual tailoring of dresses for such an important event in life: very often the bride is nervous, until the last can not stop on one option and make a change. Rita immediately trusted us and was very calm and confident in her choice, we worked with her very easily. The exclusive French lace from which the dress was made, we ordered for Premiere Vision in Paris - I saw it and immediately thought: "It must be taken, it will be someone's wedding dress", and it happened. The gentle image of Rita was emphasized by embroidery in the Russian style - it took 3 kg of natural pearls and about 150 hours of hand-made embroidery at Alena Akhmadullina atelier. Hair Stylist: NIKITA KOSY, TSVETY Beauty Bar Make-up artist: ANZHELA SAFAR-ZADE, TSVETI beauty bar Photographer: Mila Tobolenko Interview: Lika Dlugach.